Athletic.Authentic.Wild: Backcountry Skiing Gear List, 2013-14. 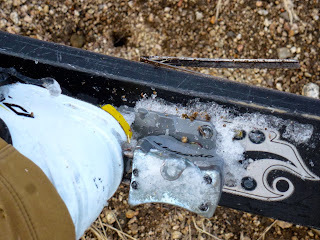 Backcountry Skiing Gear List, 2013-14. Snow is slowly accumulating here in the Eastern Sierra. As they say "We'll get ours". And when we do, be ready. Get your gear together and polish up what you carry. I've kinda got my system down, with minor tweaks from one year to another. I wrote up a similar list for winter alpine climbing. And one for Ski Mountaineering. Here and now we're talking about your typical day out. 6-8 hours at most, a group of 2-7 people, hunting down good snow and good terrain with minimal "faffing" around. 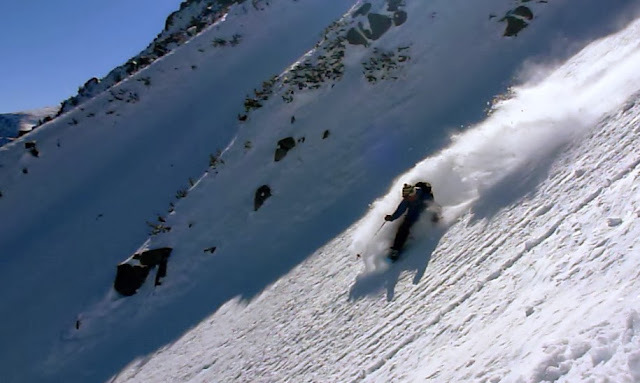 Don't think too much about it; this is standard skiing. I'll follow with a post noting what I carry for more "specialized" missions. Patagonia Houdini wind breaker. Or Outdoor Research Axiom for when the weather is full. Sunglasses. Native Hardtop, Julbo Explorer, or Kaenon Burnet, depending. Maybe, just maybe, goggles. Of the 60-80 days a year I ski in the backcountry, I probably carry goggles 2 times on average. And use them for one run before I remember how annoying it is. A liter of water and a half liter of hot drink. Ken E. getting adventurous on Mt. Gibbs. Eastern Sierra, January 2013. Darn Toughs better be number 1!